As your child moves through his or her math education, he or she will be ready to tackle more and more challenging content. However, you want to ensure each new level of curriculum for homeschooling seamlessly follows the next. enVisionMATH: Grade 4 will provide you with the materials you need to create dynamic and engaging lessons. 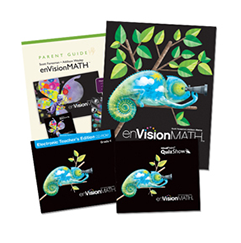 The material is Grade-level appropriate and is the logical next step once your child has completed Grade 3.
enVisionMATH is the perfect curriculum for parents who want guidance while developing lesson plans. The structure of this homeschool program is such that you will have the tools and ideas you need to educate your child to your their best ability. Grade 4 is the time when your child starts to build a concrete understanding of basic math skills, and enVisionMATH will help him or her achieve that end. Solve word problems using addition, subtraction, multiplication and division. Add and subtract numbers with multiple digits. Compare the size of fractions to one another (i.e., 1/4 is smaller than 2/3). Translate fractions to decimals and vice versa. Round multi-digit numbers up or down to any place. Explain strategies used when solving word or other math problems. Determine whether a number is missing from a set using pattern recognition skills. Measure angles found within shapes. All these skills build upon the ones your child learned in previous levels of enVisionMATH. While your child will use new curriculum materials found in Grade 4, he or she will feel that the lessons are a natural progression from Grade 3. Each unit of enVisionMATH: Grade 4 is full of engaging visual aids that will help your child grasp the concepts you're teaching. For more information on the specific materials you'll receive with enVisionMATH: Grade 4, visit the Features and Benefits page.